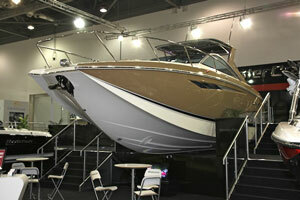 Have a look at the second part of our guide to the best boats at the show. I think we may have discovered the smartest, best built and quite simply the most luxurious 30ft cruiser around. Aquador’s new flagship is its best yet. The new hard-top design sports a proper sunroof, the cockpit is an outstanding mix of practical and social design and deck access is as safe and secure as you could ask for. Down below, the six-berth, two-cabin layout offers two separate double cabins amidships and a sumptuous forward saloon. The dark glossy cabinetry certainly adds some charm but it might not be for everyone, so Aquador is considering a lighter, more contemporary timber. It’s not cheap but given its class and build, it shouldn’t be. And in case you thought Aquadors were a bit sensible, this one will hit 40 knots with its largest twin-diesel option. A contender for boat of the show. 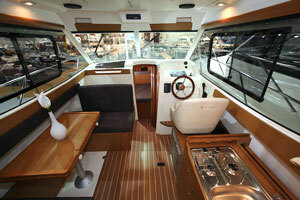 This flybridge cruiser looks big, capable and comes in at a very competitive price. Not a bad start for any boat looking to make its mark in the hotly contested and incredibly important 40ft flybridge market. On board, the bright saloon feels wide and comfortable with facing seating and a table design that is worth making the journey to ExCeL for. A galley-up design leaves plenty of space for the two en-suite cabins forward. 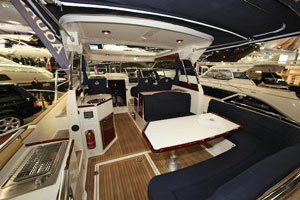 The master cabin is particularly impressive, being bigger than the Princess 42’s, with masses of headroom and stowage. 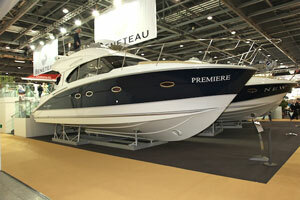 It also shows off Beneteau’s new and vastly improved finish, which is streets ahead of 2009 models. The only issue lies with the flybridge, which is accessed by a ladder rather than easy steps and is tighter on space up top than the competition. The star of the show by some distance is this new Targa. At a time when builders could be forgiven for tightening reins, hiding under duvets and simply playing it safe, Fairline has decided to create and deliver one of the most innovative, detailed and downright exciting boats in the world. From bow to stern this boat must deliver more wow factor per square foot than anything else afloat. In fact the bow and stern are where much of the action happens with an interior design that turns conventional thinking on its head and delivers a forward master suite that is quite simply exceptional. You need to see it to appreciate the brilliance of the thing. At the other end of the T58, Fairline shows off its innate understanding of boating practicalities with a beautiful tender launch system and walk-on, pasarelle-style swim ladder. The stern design also includes a proper crew cabin that means this boat will happily sleep eight. That said, you might never wish to leave the confines of the deck saloon with its huge electric side windows that drop down into the decks. This sportsfisher continues Jeanneau’s policy of using the fisher platform to deliver very comfortable cruisers. But what makes the 8 so important is that it marks the point where the size of the boat, and more particularly the interior, is truly up to a bit of extended cruising. Surrounded by glass, the wheelhouse is very bright but it’s also very warm, the timber fit-out to the dinette and galley creating a very welcoming saloon feel. Below, the forward cabin follows suit, the end result being that this is a boat you can really imagine spending time on. The decks are safe and easy to use, but Jeanneau has added its clever sundeck above the wheelhouse, so while some may choose to fish from the cockpit, others can escape up top and simply loaf. If you want proof that there is some life left in the American market, have a look at this new and very different sportscruiser from MasterCraft. The 300 looks very progressive, using the twin-tip design to deliver more forward interior space and, of course, some very striking looks. The style might be a little in your face for some but trust us that it all works in a surprisingly practical way. Features include a glass T-top above the cockpit and 35-knot V-drive performance.